John Hyam looks back on a race in Liverpool in 1949, when the race track was suddenly plunged into darkness. Zdenenk Flajshanz took these pictures of this impressive Polish circuit. Luke started his speedway life supporting the Weymouth Wildcats, he now follows the Grand Prix series avidly. "Brings back memories, helped along wth many others to get this track going in the late 60s." "What an excellent and evocative article. Shades of my first trip to West Ham in 1964 when I was 9. Belle Vue was 3 yards longer than West Ham, 418 yards as opposed to 415. I often wonder what the track record at Custom House would be now, as 70 seconds was never broken on the downside. Thank you Ian for making me feel like a schoolboy again." "Brilliant story Ian, many thanks for sharing it. Our first meeting memories are oh so similar. The smell, noise, riders on funny looking bikes with no brakes going sideways !!! Thrills and spills, dirt covered hotdogs and Chris Pusey too. I took my Champions Book of Speedway number 2, [I bought it before school the very next day], and found the snap of you in the stand. Well, which ever one you are ! Great fun mate, Cheers !!!" Those were the days of amatuer and very dedicated enthusiastic St John's Ambulance Brigade atendees for medical back up on the track, no paramedics and supporting life support equipment in the ambulances, except perhaps an oxygen bottle. Only the track Doctor would be an authority on these issues. However my recollection is that unfortunately given the very extensive time taken to remove the unlucky and unfortunate Mr Kassa, it was more than plain to all present that this was not a routine or simple accident, and was in fact very, very serious indeed. I am sure that the riders must surely have had some notion of the seriousness and doubts whilst watching the progress of the operation on the track. Just considering the ammount of people who were surrounding the area, and as mentioned the time taken to remove Sven from the track, unfortunately does not perhaps coincide with your understanding or memory of the events, independentaly with whom you may have or not discussed this with recently. My full agreement however on your standpoint is that it was horrific to witness, and without doubt nobody who loves speedway, as I still do, would remotely like to even think of such a tragedy such as this. My original ending statement I still think reveals my particular thoughts of the very sad, and as I still think, cynical end to the evening's events. It is most certainly not my intention to either offend, pricipally so long after such a horrific and difficult situation, it was very tragic and, as mentioned, none of these opinions will alter the tragic history unraveled during the evening. I was quite a bit older than your declared age at the time, and although maybe a bit naieve, although most definitely not overly so. When reflecting on this ocurrence unfortunately the taste of biterness still remains surrounding the events commented in my previous corespondence! The show must go on! Hope maybe to see you around Ashfield, if I can manage next year - still love the sport and try to catch up every year, visiting the UK and other European countries where the sport is showcased, and British Sppedway should have a look at where its going to survive. Poland for example is thriving, perhaps the most popular sport in the country, and it's a pleasure to see enthusiastic and very large crowds packing the stadia in that country. " 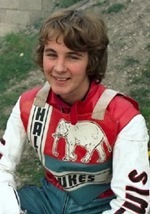 Ian Harwood looks back on his first speedway experiences - visits to Hyde Road in 1970. His first impressions and youthful enthusiam will strike a chord with many of you. 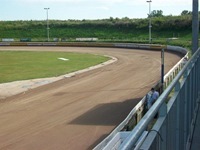 Pictures of this German track courtesy of Bob Cole who visited for the first meeting staged at the venue back in 2011. 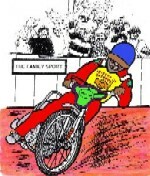 Nick shares some speedway thoughts and memories. He picks out Kenny Carter as one rider he'd like to have seen in action. 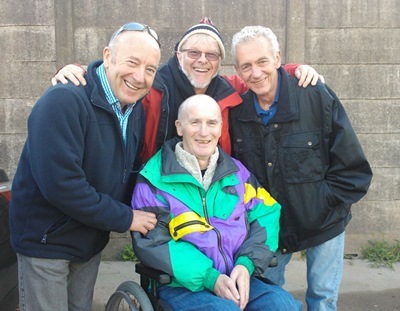 Here's a great picture of some of Belle Vue's 1972 championship winning team reunited recently. No prizes for spotting the familiar features of Peter Collins, Ken Eyre, Eric Broadbelt and Alan Wilkinson. Thanks to Ivan Blacka for the picture. "Never knew the story until I read this. So was heat 20 re run on the night or was it awarded? " "I raced for Annfield Aces back in 84/5 ish and remember racing at Davidson Mains track which now has houses on it, Jack Kane centre, the Gyle which I think you can still make out under the grass and is where I came second in the Gyle jnr championship in 84 losing to my cousin Garry. I also raced once for Edinburgh down south with lads from the Broomhall Panthers." "Will speedway ever come back to Plough Lane.....I'm afraid not.The Stadium is too big for the few people that were turning up. What I mean is, the meetings had to have security staff to serve at the bars etc. Wimbledon were not getting enough supporters to cover everybody's wages, this included the riders. The owner of the stadium at the time did not want speedway there. If they do up Plough Lane will they get Speedway back? I don't think so.....I would love to be wrong." "As a small footnote to this little piece, when former promoter Neil McFarlane heard that the Loyal Squad had re-convened, he raised the possibility of him travelling up from his south of England home to meet up with some of the troops who had formed the ranks at another Ashfield meeting. To cut to the chase, it's all happening on 25 August when the Witches are in town-such is the power of reunions, and maybe nostalgia IS still what it used to be!" "Well said Bill twas a great day. " 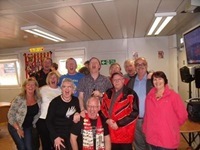 "To Billy Elliot for the article (By the way, he is the gentleman with glasses on the far right)many thanks....Like Billy I was very fortunate to be one of the lucky ones to leave my zimmer behind and enjoy what must have been a highlight to my later years...To see some "Old" friends after so long was one thing, but as Billy says to get the opportunity to once again join other members of your old family and look at photos and discuss stories which seem to vary dependant on who's memory you believe. I know I speak for all when I say thank you to Jim Coyle and the Glasgow Promotion, for allowing us to go back to our youth. It says a lot for true friends when my old scarf turned up still in tact after all these years....So to Jim and Liz, I say thank you"
"My dad Jimmy Duncan loved speedway and used to tell me about me going to Meadowbank when I was a toddler. I grew up going to Coatbridge and Berwick but Powderhall was the place where magic happened. Friday nights with the smell of chocolate from the factory and standing at the 30 yard line with my dad was just a special time. Sadly dad died last year but was a Monarch to the end. I heard the Black Bear recently and it just brought back so many happy memories. I've been to Armadale but its just not the same"
Bill Elliot reports on a recent gathering of fans who brought colour and noise to terracings around the country in the 70s. Pictures of Korskro Speedway in Denmark, courtesy of Phil Rice who visited on Wednesday on his way to the GP qualifier at Holsted. 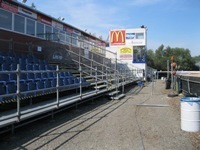 RETRO Speedway are appealing for Speedway Plus readers to become part of their latest project. 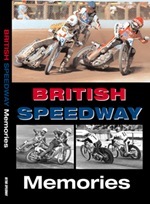 Later this year RS will publish a new book called BRITISH SPEEDWAY MEMORIES. As the title suggests, it will be a compilation of personal memories as recalled by those of us who have a passion for our wonderful family sport. Here's how you can get involved. 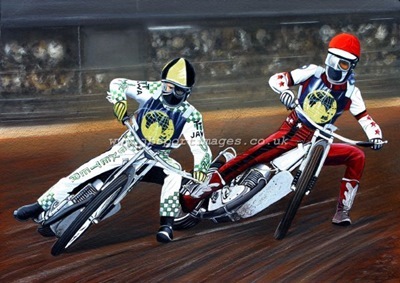 Jim Blanchard's latest painting features Ivan Mauger and Tommy Jansson in action at the 1975 Internationale. As usual, Jim will be donating some copies to good speedway causes. If you'd like to purchase a print then you'll find full details on Jim's website. "Mr Lewis have you ever thought the fact for the delay in making the announcement at Hampden that tragic evening was down to the fact that The Promotion wanted to inform Svein's next of kin before making a public announcement? Having talked to various riders who rode that evening, including family members, not all were fully aware of the seriousness of the accident and had they been they certainly would not have ridden on. I was there as an 11 year old and it's not something I ever want to experience again and would hope no one ever witnesses such a sad occurence. " "I dont know if Mitch was at White City or not. I have the programme and he wasnt even listed as a reserve. 17 was Mike Lee. 18 Scott Autrey. 19 Gary Guglielmi. As for the other questions, I don't have the answers. Muchos speculation! You must remember that Barry Briggs and Ivan Mauger were hugely influential personalities. Perhaps they had clout we know nothing about?! All I know is what Ivan told me on the phone. Briggs said, "don't let Mitch ride." So were they above the FIM? Certainly would appear so because Ivan indeed, did not let Mitch ride! Had he stepped down, as he suggested he might after that NZ round, Mitch as NZ Champion would have had the 'fought for' opportunity to qualify. No saying he would have! But had Mitch failed to qualify, it would have been on the track, down to him and not the result of a phone call between World Final co promoters!!! Mitch wasnt the only one cheated. The NZ speedway public was too. Firstly, no Australasian Final and second, NZ's only other World Final prospect made to miss his legitimate place. Third, Larry Ross blew the last round and so no Kiwis would ride in LA. As Ivan told me, he and Briggs had issues with Mitch Shirra's lifestyle. Seems they had no problem with the Yanks and everyone knew what they were up to. Oh but the World Final was being held in the home of Mickey Mouse. Nothing wrong with that, never did Walt Disney any harm !!!" "Was expecting to see my name in the Peterborough line up, especially as Carl Johnson only made a few appearances in my absence (broken arm)." A bumper selection of pictures of this unusual venue in France. 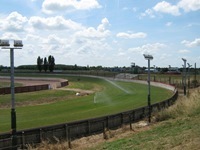 There's a vast grass track circuit around the outside of a traditional speedway track. These pictures are courtesy of Ian Presslie who visited in 2009. Details of the 50th edition of the fanzine written by and for the fans and published by the Friends of Speedway organisation. Campaigners hope that Speedway can return to Plough Lane as part of the redevelopment of Wimbledon Stadium. Further details on how to get involved can be found in this We Want Wimbledon pdf file. Tania van Riel is looking for memories and photographs of her uncle Merv Harding. Merv is of coure well remembered as an Ashfield Giant - Can You Help? On a similar theme, Bryn Hayward wonders if anyone remembers Dave Tamplin - Can You Help? "Graeme Frost's picture just reminds me of all the happy Fridays spent watching The Tigers. Wonder who the gentleman is waiting for at what yould have been the Pits? " "I was an avid fan of Hurriken and screamed blue murder at Charlie Monk on the night at Custom House. Saw the replay, McKinlay was running out of track and laid it down - Monk was blameless. However, not a great fan of Monk. Unfortunately, he had a surly manner towards fans. " "Fascinating article about backstage machinations prior to the 1982 World Final in Los Angeles, but it raises a few questions that I wish Mr. Holmes would illuminate. 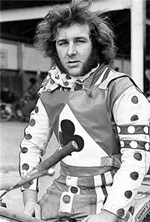 If the FIM ruled that Shirra was to ride in the Overseas Final, how did Mauger end up riding instead? Briggo's s tatement, "Don't let Mitch ride!" seems odd, because what authority did Mauger have to control who would be allowed to participate, especially since the FIM had already decided? What was Shirra doing as Mauger usurped his spot at White City?" "Just found this all about Belle Vue speedway. Great memories came flooding back one - name jumped out at me who wrote on your web site Sydney Dixon. Remember me Sid? I had a brother called Paul nick name (shaking brooks) because he used to always dance like Shaking Stevens. Paul is no longer with us, when he passed away Belle Vue speedway had a 1 min silence for him and it was in the programe which I still have. We went all over the country following Belle Vue and Peter Collins. We used to get a lift a lot all over from Fred & Mavis Ball. Great memories they will never be beat. I loved my speedway days."